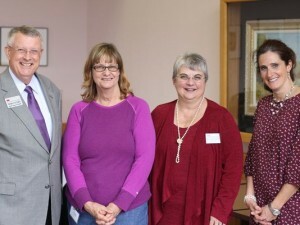 Corning Children’s Center Executive Director, Peigi Cook, was presented with the 2016 Early Childhood Professionalism and Leadership Award at Corning Community College’s First Annual Joint Meeting of Academic Program Advisory Boards this morning. Peigi Cook has set the standard in the early childhood education field since she began her career almost 40 years ago. She relocated to the Corning area to accept the Executive Director position at Corning Children’s Center in 1993. Peigi has been an active leader at the Corning Children’s Center for 23 years, helping it grow from a small organization in a church basement to the state-of-the-art Center it is today. Peigi not only adheres to professional standards within the field of early childhood education but works hard to push the standards forward. 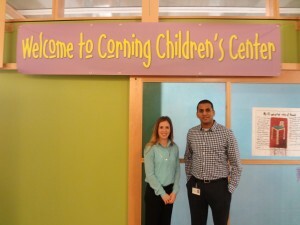 She introduced the concept of Continuity of Care to Corning Children’s Center in 2000, 16 years before it was included in the New York State Regulations as a valued concept. More recently, Peigi introduced a Mandarin Immersion Program concept to the Center that has been implemented into nine classrooms for 130+ children ages 18 months to 5 years old. These are just two examples of how Peigi has been a leader in the field of early childhood care and education. We are so proud to announce the Krista Gilliam, one of our Infant Lead Teachers, was awarded the Terri Lynne Lokoff/Children’s TYLENOL® National Child Care Teacher Award at a ceremony in Philadelphia last week. Krista’s project outlines a plan to build an outdoor musical garden. She was recently featured in the Star Gazette and the article can be viewed online here. The Corning Children’s Center welcomes two new Board of Director Members, Stephanie Carl and Raj Pakyala. We also would like to thank Sharon Stone for her 6 years of dedicated service to our Board. 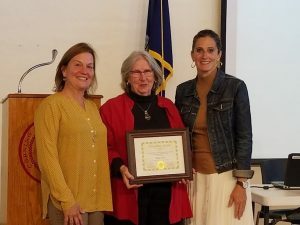 Corning Community College recently presented Barbara Pickering with the first Early Childhood Professional and Leadership Aware. The award honors a professional provider in the field of early childhood education who embodies the qualities of professionalism and leadership in daily work settings. 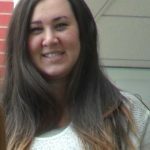 Pickering is a lead teacher at the Corning Children’s Center. The award was presented by Shanna VanPatten, who described Pickering as a rare employee and a mentor and model of best practice. 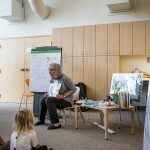 Tracey Campbell Pearson, author and illustrator of Elephant’s Story and other books for young readers, read, drew and shared stories of her journey as an artist and author with our young audience. On Friday, June 26, Corning Children’s Center celebrated International Mud Day – a day where children, parents, and early childhood professionals celebrate nature, outdoors, and messy fun by getting, well, muddy! “Children learn through play and what a better way to do it than by getting down and dirty?” said Lisa Barrett, infant-age specialist at the Center. Many thanks to the enthusiastic and dedicated volunteers who joined us during United Way’s Day of Caring to help install a beautiful Hobbit Hole for children to explore! Your efforts help make the Center a special place for all our young dreamers. 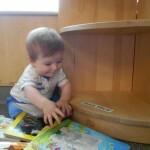 Corning Children’s Center needs 100 new books for our Children’s Library. For each $15 donation, your name or the name of the person you make the contribution in honor of will appear on a bookplate in a book. Please donate and share our https://rally.org/BooksForCenter page. Thank you!